Welcome to Part II of our Interview with Roberto Blake! This is part 2 of our exclusive interview with Roberto Blake. In the first part (you can read it here), Roberto talked about his journey as an evangelist of Creativity while not forgetting to share some actionable tips for his followers. Q: Many may not know the gruelling schedule and effort you put in to make each video. Can you share how many hours you invest in making each video – time spent in shooting, editing, promoting etc. RB: Just 30 hours a month to do 30-40 videos. A ton of stuff you guys don’t see for months sometimes because I just have so much unedited content laying around. I do everything myself but I’m going to start hiring people to edit my back log of content. But in all fairness, the type of content I do is easy to mass produce. Promoting is something I set in place mostly with automation, so that was just learning a process that makes sense. This won’t work for everyone but it could for most people honestly. Especially business. Q: You create 5-6 videos every week and would soon be hitting 900 videos! How have you been able to stay consistent and motivated as a vlogger to keep uploading quality videos so frequently? Can you shed some light on your routine for this? RB: For me, I’m driven and motivated by an honest desire to fight for creative people. Creatives don’t get a ton of support sometimes, and successful creatives sometimes horde their knowledge. I have to do that much content to give everything in my brain away. I literally have most of my content calendar mapped out for the year by playlist and day of the week just like a TV producer would. Q: What do you enjoy most about your life as a successful YouTube influencer who’s helping other become successful? RB: You just said it, helping other people become successful in their lives as creatives. Q: While not working on videos and public speaking, what are the activities you resort to unwind from the busy schedule? RB: I really dig art and photography, which means even while I’m doing that , my skills are getting sharper. I also really enjoy reading and travel for the sake of traveling. Comics and films are also something I enjoy. 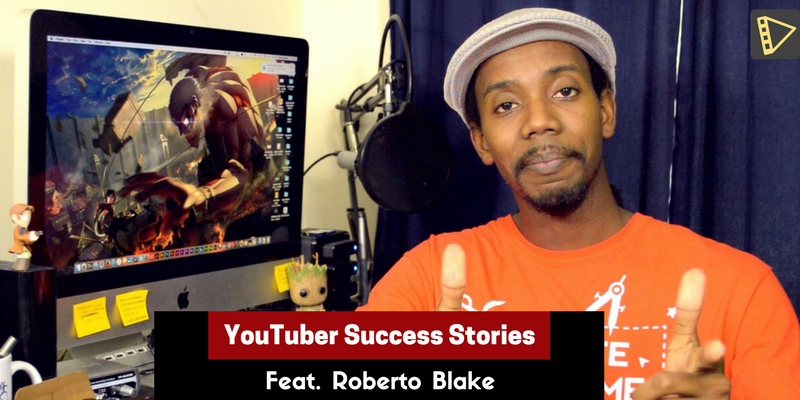 Q: What is your vision for your channel and the brand Roberto Blake for the future? RB: My personal brand and channel has always just been a blueprint and experiment to prove how creative and technology can empower people to make their passion practical. My vision is for my company Create Awesome Media to help take that blueprint and allow others to apply, and at some point to be able to invest in it, while also producing more educational and motivational content and intellectual properties. But this is a long term plan that doesn’t have to materialize right away. RB: Honestly I think I really am starting to fall in love with Public Speaking more because it lets me directly interact with people and because of how much Q&A I like to do. I don’t like telling my life story, I like helping people write their’s. Roberto spends a considerable amount of time speaking in conferences and forums. Q: Your 2 cents of advice to all budding YouTube creators and vloggers around the World? RB: Ignore your numbers and commit to making 1000 pieces of content you are proud to put your name and reputation too. Liked the interview? Make sure you leave a comment below. Feel free to ask questions and share what more would you like to learn about. We will make sure we share it with Roberto. This interview was conducted by Matthew John from Typito.